Janet and Mike are a sweet couple, smart, and funny. I enjoy their company. I met them through a friend a few years ago. Janet and Mike got pregnant with twins after being married over a decade. They delivered their babies early, 16 weeks early. Which means their twins Jaina and Cade were born at 24 weeks. Sweet baby Jaina fought hard for a few days, but is now waiting in heaven for her family. 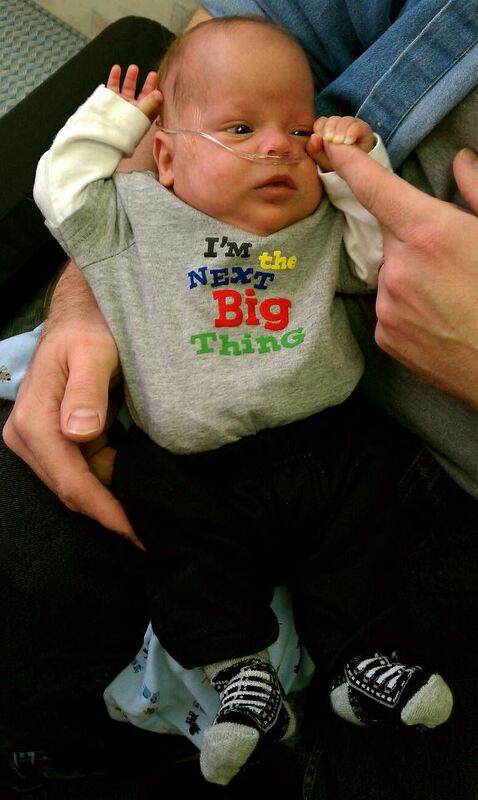 Cade spent about 4 months in the NICU surrounded by nurses and doctors who cared for him expertly. I cannot imagine travelling back and forth every day like Janet and Mike. I cannot imagine the pain of bringing Cade home without his sister. Cade 4mo old and home! Why am I telling you this story and showing you an adorable baby photo? Janet is participating in the March Of Dimes walk and is raising money in honor of her beautiful son Cade, and in memory of her precious daughter Jaina. I'm hoping that by being a friend of TheCatholicLovebirds and all that we love, you might consider donating to this fight. There are so many babies born early, March of Dimes is doing everything they can to prevent this. When it can't be prevented March of Dimes does what they can to support these babies and their families. Think of all your friends, how many have been affected by miscarriage, early births, premature or preterm births, birth defects? Then click the link below and donate. Donate in honor of the babies that fight to become adults. Could you give a dollar? One dollar isn't much of a sacrifice really when you think of it... You've probably got that much between the couch cushions.